Shoulder arthritis is a condition in which the normally smooth cartilage covering the ball and socket of the shoulder joint is lost due to disease, wear and tear, injury, or surgical misadventure. If you have questions regarding the surgical treatment of arthritis, feel free to email Frederick A. Matsen III, M.D. at matsen@uw.edu. In shoulder arthritis, the smooth cartilage that normally covers the surfaces of the ball (humeral head) and socket (glenoid) is lost. The result is that there is bone on bone rubbing between these two joint surfaces. This bone-on-bone contact produces pain, stiffness, difficulty sleeping and the inability to do activities of daily living, work and sports. Shoulder arthritis may result from wear and tear, osteoarthritis, rheumatoid arthritis, rotator cuff tears or may follow surgery for recurrent dislocations. Shoulder arthritis can be diagnosed by a careful history and physical examination along with properly done x-rays. Each type of arthritis has a particular x-ray appearance. Treatment of shoulder arthritis may include exercises, a ream and run procedure, a total shoulder, or a reverse total shoulder arthroplasty. A shoulder surgeon experienced in joint replacement can find out if arthritis is the cause of the problem and if surgery would be helpful. Patients are most likely to benefit from this surgery if they are well motivated and in good health. The timing of the procedure is largely up to the patient. A shoulder surgeon experienced in joint replacement can find out if arthritis is the cause of the problem and if surgery would be helpful. Patients are most likely to benefit from this surgery if they are well motivated and in good health. The timing of the procedure is largely up to the patient. 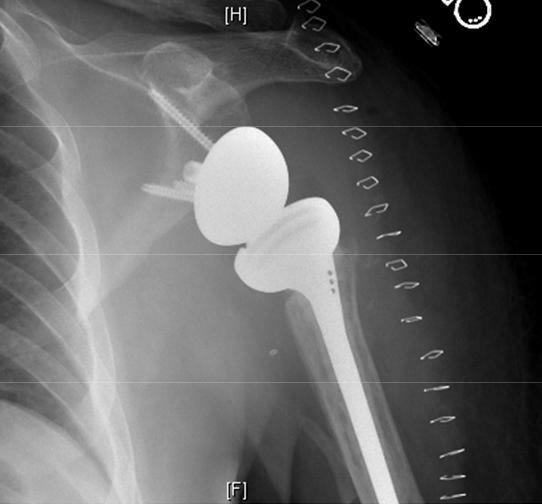 The goal of shoulder replacement arthroplasty is to restore the best possible function to the joint by removing scar tissue, balancing muscles, and replacing the destroyed joint surfaces with artificial ones. Shoulder joint replacement arthroplasty is a highly technical procedure and is best performed by a surgical team who performs this surgery often. Such a team can maximize the benefit and minimize the risks. At the Unversity of Washington, we perform 5-10 shoulder joint replacements each week. Our goal is to customize the procedure to the individual patient’s activity goals and their particular pattern of arthritis. We have published many articles relating to the treatment of shoulder arthritis. There are a few medical emergencies with shoulder arthritis. Generally this is a chronic condition. If the shoulder is hot and swollen, infectious arthritis may be present, and immediate evaluation is needed. Many individuals do not know that arthritis can affect the shoulder. Although the shoulder is less likely to be involved with arthritis than the hip or knee, shoulder arthritis is actually quite common. While in the past there were no effective surgical procedures for shoulder arthritis, now advanced techniques in surgical reconstruction can help restore comfort and function to the shoulder. The only type of shoulder arthritis that is potentially deadly is infectious arthritis, that is arthritis associated with a major infection of the joint. Pain is a common component of shoulder arthritis. Individuals with shoulder arthritis often have pain at night that prevents sleep. The pain is located in the area of the shoulder joint and may be increased by physical activity. Shoulder arthritis cannot be cured with pills, injections, or changes in diet. Loss of shoulder motion is common in shoulder arthritis. Shoulder arthritis may affect the individual’s daily activities, such as sleeping, housework, driving, as well as the individual’s ability to shake hands, hug, and have intimate relationships. Individuals with chronic shoulder pain often feel fatigued because of the extra effort required to cope with the condition. Shoulder arthritis is usually not associated with a major deformity, although some types of arthritis can result in substantial swelling around the joint. Arthritis is a common cause of loss of comfort and function. Shoulder arthritis is, after the knee and hip, the third most common joint to require surgical reconstruction for arthritis. Joint replacement for shoulder arthritis is most commonly performed on individuals ranging in age from 45 to 85. Males and females are equally affected. The risk of osteoarthritis (degenerative joint disease) is increased in individuals with a history of prior shoulder injury. Rheumatoid arthritis is more common in females. There is no known pattern of inheritance for shoulder arthritis, although some families do have an increased prevalence. While shoulder arthritis can be attributed to heavy physical use of the shoulder or to shoulder injury, many individuals have shoulder arthritis without a recognized cause. Genetic factors for shoulder arthritis are yet to be determined, but research in this field is active. Shoulder arthritis is not contagious. 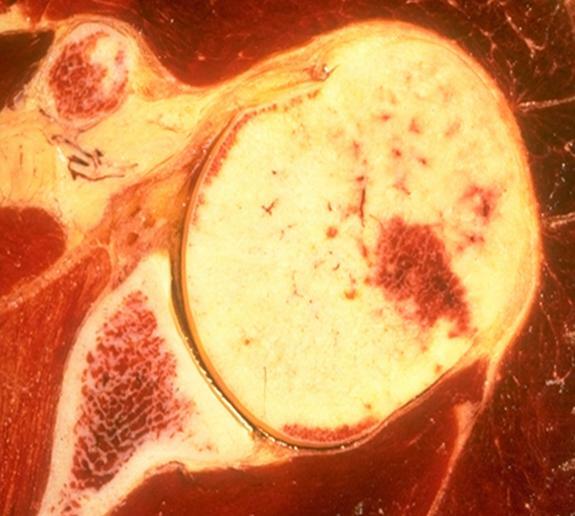 Diet and metabolism are rarely factors in the development of shoulder arthritis. The exception is gout. The risk of shoulder arthritis is increased by previous injury or surgery of the shoulder. The risk of shoulder arthritis may be reduced by avoiding shoulder injury and by maintaining the flexibility of the shoulder using gentle stretching exercises. Shoulder arthritis affects the glenohumeral joint, that is the joint between the ball of the arm bone (the humeral head) and the socket of the shoulder blade (the glenoid). It may also affect the rotator cuff. The first symptoms from shoulder arthritis are often stiffness, pain at night and difficulty using the arm for activities overhead and out to the side. The symptoms may wax and wane over time, sometimes being aggravated by changes in the weather. Shoulder arthritis may cause pain, inability to sleep, stiffness and grinding when the joint is moved. Shoulder arthritis may progress slowly or rapidly, depending on the type of arthritis. Shoulder arthritis may cause aching up and down the arm, but usually does not produce numbness, tingling or weakness of the hand. The symptoms of shoulder arthritis may at times be similar to the symptoms of frozen shoulder, rotator cuff tears, or even a pinched nerve in the neck (cervical radiculopathy). In shoulder arthritis, the normally smooth cartilage that covers the ends of the bones is lost and the bone ends start to erode (click here for more about FAQ about Arthritis). This cases pain, stiffness and grinding on shoulder motion. A physician diagnoses shoulder arthritis by taking a good history of the problem, performing a thorough physical examination of the shoulder and neck, and taking precise X-rays to evaluate the status of the joint. 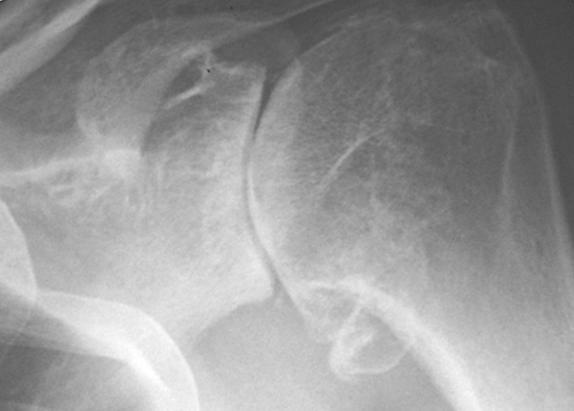 In osteoarthritis, X-rays typically show loss of the normal joint space, bone spurs (osteophytes), and loss of centering of the ball in the socket (click here for more about "Total shoulder joint replacement"). Laboratory tests, other than routine blood and urine tests, are usually not necessary. In special cases additional tests, such as an MRI, CT scan or lab tests may be helpful. The tests are not usually uncomfortable or invasive. Sometimes the shoulder is so stiff that positioning the arm for the X-rays is painful. Shoulder arthritis can be diagnosed by any physician who has experience in evaluating shoulder conditions. This may be an orthopedic surgeon, physiatrist, rheumatologist, or primary care physician. Our treatment team includes a therapist dedicated to shoulder rehabilitation. Determining the best treatment for an individual with shoulder arthritis requires substantial experience. Because shoulder arthritis is much less common than knee or hip arthritis and because many fewer surgeries are performed for shoulder arthritis than hip or knee arthritis, there are many fewer experienced shoulder surgeons than knee and hip surgeons. Patients considering shoulder joint replacement (total shoulder arthroplasty) should consult with an individual who performs these surgeries frequently. All treatment should be performed on the recommendation of a qualified physician. The non-operative management of shoulder arthritis may consist of gentle range of motion exercises, such as those shown on our exercise post and non-steroidal anti-inflammatory medications if these are well tolerated by the individual (click here for more about FAQ about Arthritis Medications). Sometimes modification of the use of the shoulder, such as reducing impact and load, may be helpful. Injections of cortisone or other medications have not proved to be durably effective. Ream and Run procedure. News Coverage of UW Medical Center's Innovative Shoulder Surgery Ream and Run is a new and innovative shoulder replacement surgery designed for adults living an active life. This procedure was pioneered by Dr. Matsen. 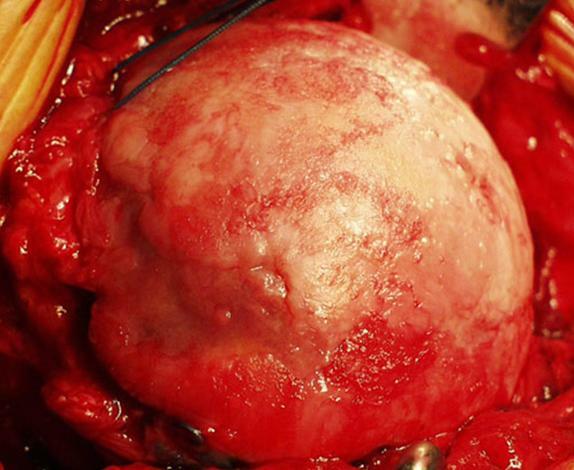 Total Shoulder Joint Replacement Arthroplasty. Dr. Matsen discuss the classical ‘Total Shoulder’ procedure as performed at the University of Washington. Dr. Matsen discusses a new and innovative shoulder replacement surgery featuring a reverse ball/socket technique that can lessen pain and improve function in shoulders with failed surgery or combined arthritis, rotator cuff tears and instability issues. 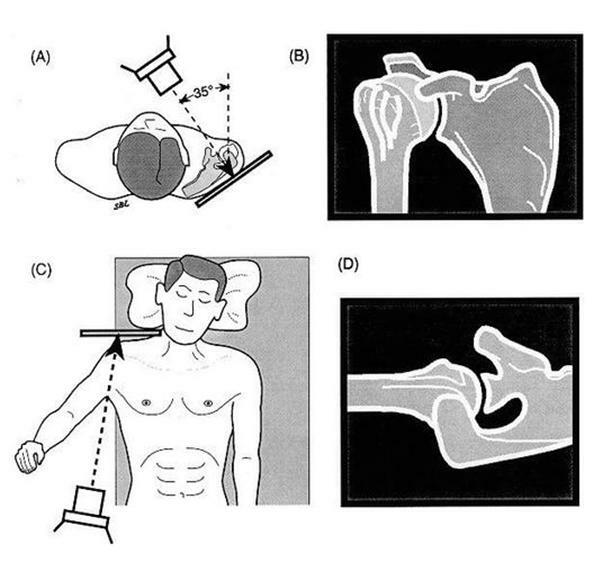 The patient may be able to improve the comfort and function of the shoulder with home exercises and mild medication. However, these should be performed only under the direction of a qualified physician. There are many common sense approaches to managing arthritis (click here for more about FAQ about living with arthritis). Most cases of advanced shoulder arthritis are managed by orthopedic surgeons with special training in shoulder reconstruction. Less severe shoulder arthritis can be managed by rheumatologists, physiatrists, and primary care physicians. An important part of the management of the person with shoulder arthritis is to manage the entire health of the individual (i.e. managing arthritis pain). If the pain is severe enough to require narcotics, specialists in pain management are often needed. If fatigue is a major feature of the condition, evaluation by an internist or primary care physician is needed to exclude factors such as anemia or underlying illness. When recommended by a qualified physician, gentle exercises, such as those described at the shoulder exercises post may help with the stiffness associate with shoulder arthritis. In milder cases of shoulder arthritis, physicians may recommend non-narcotic medications such as acetaminophen (Tylenol) or nonsteroidal anti-inflammatory drugs (NSAIDs) such as naproxen sodium (Aleve). These medications are not expected to cure the condition, but may lessen its symptoms (FAQ about Arthritis Medications). Dietary supplements, such as glucosamine and chondroitin sulphate have not been proven to be effective in shoulder arthritis. 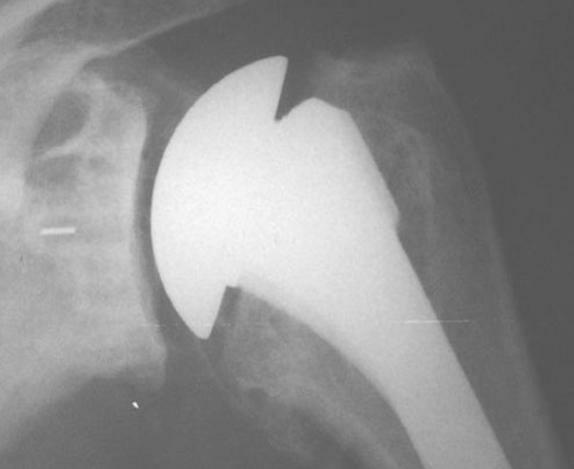 a total shoulder arthroplasty in which the replacement of the ball of the arm bone (humeral hemiarthroplasty) is combined with the insertion of a plastic socket (glenoid). 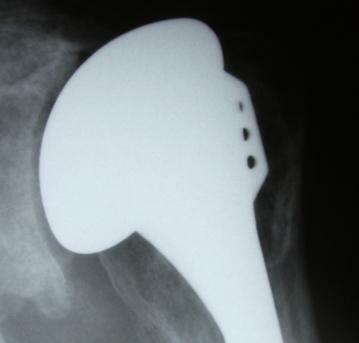 a reverse ball and socket (Delta) total shoulder replacement arthroplasty. Shoulder arthroscopy has not been proven to be effective in the management of shoulder arthritis. 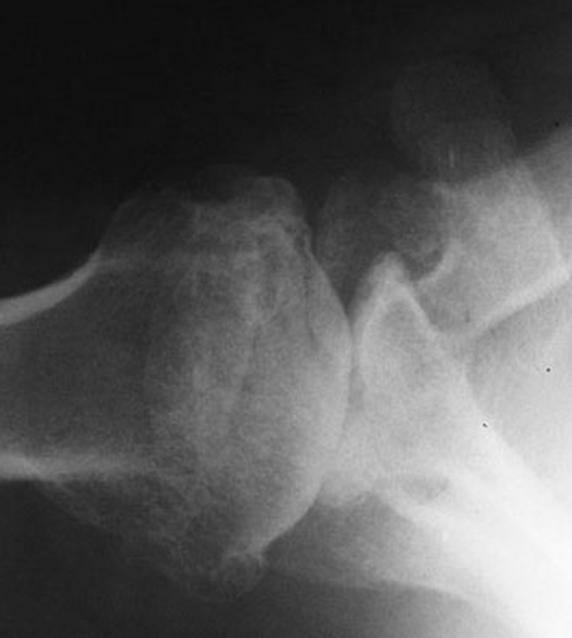 Joint aspiration is the process of removing some fluid from the sore joint. This procedure is usually not helpful in the treatment of shoulder arthritis, unless there is a suspicion of infection or gout. Injecting the joint with cortisone, steroids or other agents has not provided durable benefit to affected shoulders. Splints and braces have not proven helpful in managing shoulder arthritis. Relaxation techniques, such as meditation, visual imagery, progressive muscle relaxation, yoga, or biofeedback may be helpful for people with shoulder arthritis, but the benefit of these approaches has not been proven. The limitations on social interactions imposed by shoulder arthritis can usually be lessened by successful management. It often is difficult to be patient when suffering from shoulder arthritis. People with shoulder arthritis might be tempted to try unproven treatments, such as copper bracelets or magnets. The sensational successes advertised are usually not supported by documented results. They even may be harmful and often keep people from getting the medical care they really need. New treatments should be discussed with a doctor and get his or her advice. Individuals with shoulder arthritis may be able to cope with their condition by reducing the demands on their shoulder. Planning life so that there is less need to reach, lift, push, or pull may be helpful. Some individuals with shoulder arthritis are more comfortable sleeping in an armchair than flat in bed. The Arthritis Foundation may be able to provide assistance in coping with shoulder arthritis. Individuals with shoulder arthritis may be able to modify their jobs by reducing the demands on their shoulder. Changing their work so that there is less need to reach, lift, push, or pull may be helpful. Shoulder arthritis in one member of the family can affect the entire family. It is helpful for the family to become informed about the condition and its treatments. Individuals with shoulder arthritis may be able to use adaptive tools to help with their reach and personal hygiene. An occupational therapist is often a good source of information on these adaptive aids. Shoulder arthritis can often interfere with normal sleep, fitness and recreational activities. This can increase stress. Maintaining regular exercise through walking or stationary cycling is helpful in reducing stress and maintaining fitness. For more information regarding shoulder arthritis, individuals may wish to visit our blog. Scientists at the major medical schools are constantly working on better ways to prevent and treat shoulder arthritis. One promising approach is to use a type of surgical reconstruction that avoids the need for plastic or bone cement that enables high levels of activity. While drug companies are seeking new medications for shoulder arthritis, so far these approaches have not produced durable improvements in the treatment. There is some evidence that gentle stretching exercises may slow the progress of shoulder arthritis. 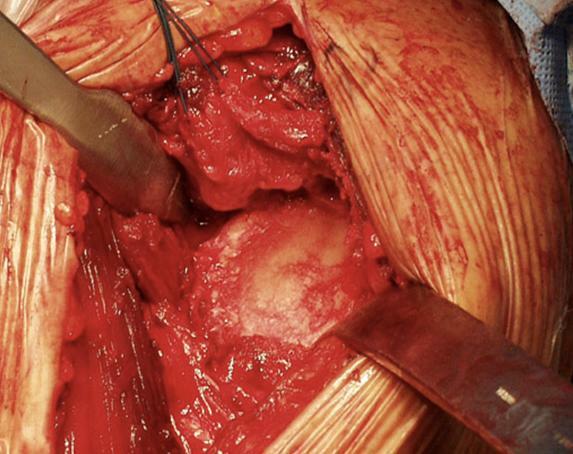 Research in the surgical management of shoulder arthritis includes efforts to avoid the potential risks of plastic and bone cement and new methods of managing shoulder arthritis in the presence of severe rotator cuff deficiency (click here for more about Cuff tear arthropathy and Reverse Shoulder Replacement (Delta joint replacement). There is interest in biomedical treatments for shoulder arthritis, such as using stem cells and growth factors (click here for more about stem cell and regenerative medicine). However, the clinical role of such treatments have yet to be defined. Shoulder arthritis is a common cause of limited comfort and function of the shoulder. Shoulder arthritis may be helped by gentle stretching and non-narcotic anti-inflammatory medications. Shoulder arthritis is diagnosed by a thorough history, physical examination, and proper X-rays. Severe shoulder arthritis can often be successfully managed by surgical reconstruction (replacement) of the damaged joint surfaces. Newer surgical techniques, such as the ‘ream and run’ can allow patients to return to higher levels of physical activity.